People are your greatest asset. What do they really need? Our independent, anonymized app helps everyone get the real truth. 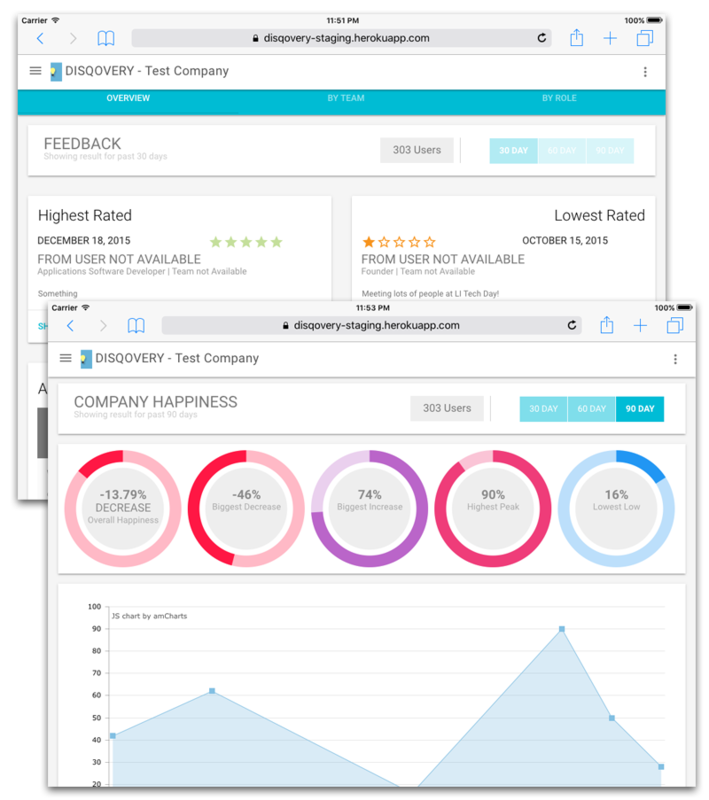 Build comprehensive understanding of your employees and construct a more cohesive team. Address issues proactively, and help your teams thrive. Improve your top-line and bottom-line at the same time. How are you staying on top of the evolving employer-employee relationship? Honest feedback is hard; employee engagement is even harder. Staff surveys are not scientific, and top companies are abandoning them. 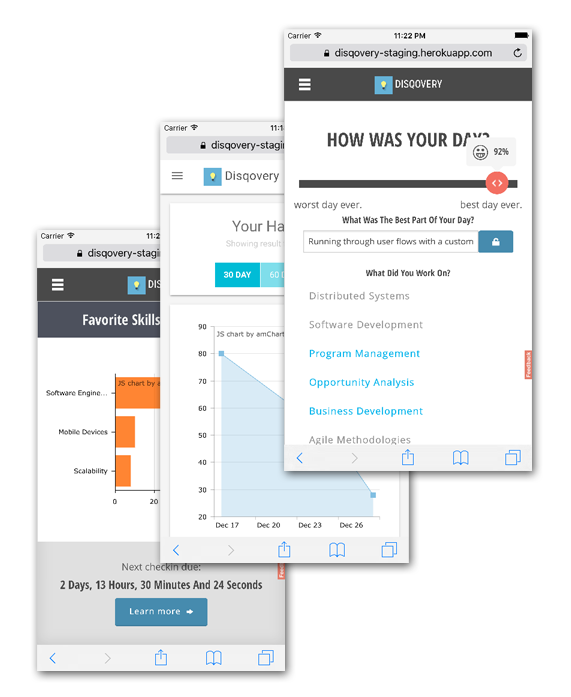 Disqovery helps you understand your people better and figure out what’s really important. We use feedback to drive engagement and retention. You get analytics to understand what’s going on with your team and your culture. Forget about gathering and compiling data. We’ll do it for you. We want you to focus on the strategy. We use experience sampling to build an app that’s simple, and even fun. We ask employees a lightweight set of questions every few days. 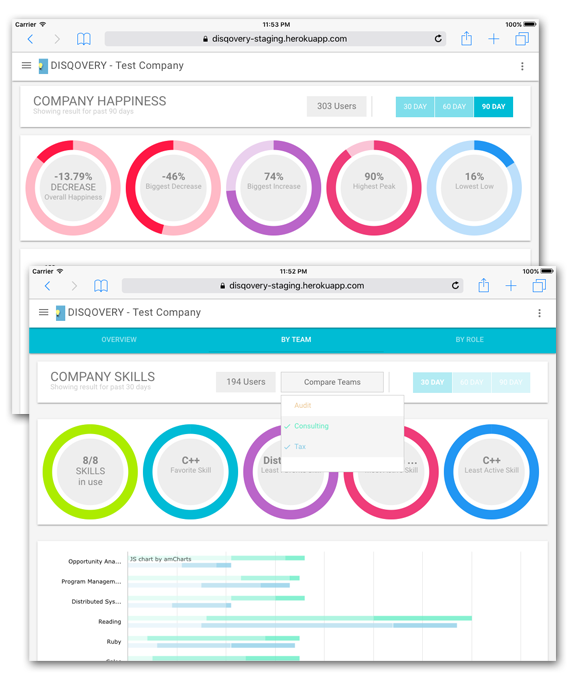 Our analysis engine recommends opportunities to improve the workplace and the work experience. All of this takes 30 seconds or less. Surveys are long and boring. You do them annually or semi-annually, right? That's so rare that the data is anything but useful or accurate. Actionable Feedback: Understand what your people are saying and what they need. Make changes and immediately measure the impact. Remote & Mobile Employees: Teams that are harder to manage by ‘walking around’ get the same benefits. Rotating Duties: Know what highly-valued employees get satisfaction from. Place people on the projects where they will be the most engaged, and therefore at their best. Let's build organizations that thrive. Do you care about building a healthy work environment? Get up and running within just one week by saying hello. Build better people. Build better teams. Quitting is Hard, but it’s healthy!